A dumbbell bench press is a weightlifting move that is performed from a horizontal position using free weights. The person lies down on a bench with the appropriate amount of weighted dumbbells in each hand. The person then lifts the weights beginning from the chest, stretched out to arm’s length and then lowered back down to the chest. The execution of this complete move is known as one repetition. Doing three or four sets or 12-15 repetitions is a comfortable amount for beginners and established athletes, but an exerciser can do more or less, depending on his or her levels of fitness and strength. This exercise is typically done with free weights because they allow more freedom in movement and range of motion to execute the move better than machine weights. When a person is performing a dumbbell bench press move, it’s important for him or her to lie down flat on the bench to avoid straining the back. Lying flat will also cause the body to utilize the abdominal muscles instead of the back muscles to hoist the weights up to the chest. To further maximize this exercise and minimize any occurrence of injury, the individual should use his or her thighs to raise the dumbbells, and not the forearm or back muscles. This can injure the wrists or the rotator cuff muscles and can also cause pain and discomfort. By lifting the thighs up toward the chest while the dumbbells rest on the them, the exercise can be performed more easily and safely than trying to lift the weights from the floor or straight up from the thighs. It’s also important for the exerciser to maintain full control of the dumbbell bench press exercise at all times. 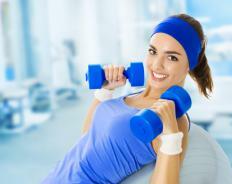 The dumbbells should be kept at the sides of the chest, creating a 90-degree angle with the forearm and upper arm. This is the starting position, and as the move is executed and the dumbbells are pushed up, the arms should be locked at the top of the move. At the top, the individual should squeeze his or her chest and descend the dumbbells slowly back down and to his or her side. Ideally, it should take twice as long to lower the weights as it did to raise them, which will allow the exerciser to obtain the maximum benefit from the move. Safety can be an issue during a dumbbell bench press. Rotator cuff injuries can result if the dumbbells are dropped to the floor instead of being lowered. The motion of the weights ejecting suddenly from a person’s hand can cause the connective muscle tissue to snap from the movement. What Is a Grip Hoist? What are the Best Ways to Build Pectoral Muscles? How do I Develop the Best Bodybuilding Chest?